This tour starts at 6:00AM on Saturday, December 14, 2019 in Cairo, Egypt. In the morning, we'll leave Cairo, as we take an early morning flight to Amman, Jordan. From the Amman airport, we'll drive towards Petra and the Wadi Rum Desert. Often referred to as the Valley of the Moon, it is the largest “wadi” (valley) in Jordan, known for its unusual rock formations and as the filming site for the Lawrence of Arabia movie. After exploring the wadi, on foot and with friendly Berbers in their trucks, we'll drive to Petra in the late afternoon and check into our beautiful hotel. In the evening, we'll enjoy a relaxed dinner in the hotel's elegant restaurant. Today, we’ll spend the entire day exploring the city of Petra, learning about its historical and archaeological significance. Dating to around 300 B.C., Petra was the capital of the Nabatean Kingdom. Today, it is accessed via a mysterious, narrow canyon called Al Siq, and its tombs and temples carved into pink sandstone cliffs earn it its nickname, the "Rose City." Perhaps its most famous structure of Petra is Al Khazneh, a temple with an ornate, Greek-style facade, also known as The Treasury. In the evening, we'll enjoy another elegant dinner at the hotel's restaurant. After checking out of the Petra hotel, we'll make our way back towards Amman and the Dead Sea, stopping at several of the country’s most famous Biblical sites. We'll visit Madaba, the city of mosaics, best known for its Byzantine map of the Holy Land of Jerusalem. We'll stop at Mount Nebo, from where, according to the Bible, Moses saw his first glimpse of the Promised Land as well as at St. George's Church and the Baptismal sites. We'll also tour Al Karak, built around a Crusader castle, the largest medieval castle in the region. In the afternoon, we'll arrive at our resort hotel, right on the shores of the Dead Sea, and we'll have some time to enjoy the ambiance of this unusual location before dinner at the hotel's restaurant. Today, we can enjoy a full day of relaxing on the shores of the Dead Sea, taking advantage of the resort's relaxing Dead Sea minerals spa, taking a walk on the beach or swimming in the highly-salt saturated water of the Dead Sea, enjoying the resort's gardens and other amenities. We'll meet in the evening for another dinner together. 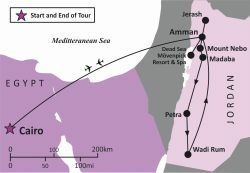 After checking out of the Dead Sea Resort, we'll make our way to Amman, stopping in the ancient city of Jerash. Referred to as the city of a thousand columns, Jerash is a walled Greco-Roman town, featuring the 2nd-century Hadrian’s Arch, Corinthian columns of the Temple of Artemis and the immense Forum’s oval colonnade. In the afternoon, we'll fly back to Cairo, and check into the Le Méridien Airport Hotel in Cairo, where we'll enjoy our last dinner together, before flying back home tomorrow. After breakfast, we'll have individual transfers to the airport in accordance with our return flights departure times. This tour ends after breakfast on Thursday, December 19, 2019 in Cairo, Egypt.